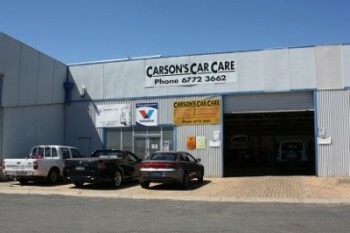 Carson’s Car Care, situated in the busy industrial area of West Armidale is a family owned business. Terry recently took control of the business with Dennis going into retirement, although he is still available when required. Terry joined the business in 2003 as an apprentice so has recently achieved his 15 years in the trade. Dennis’ wife Margaret continues her role in the office. To complete the team, Ivan Tremayne has now been with the business for over 10 years, previously working in the local Holden dealership, and Campbell Berryman joined the team as an apprentice in 2013 and continues now as a fully qualified technician. With a fully equipped workshop, the team pride themselves in their workmanship and service provided to their customers. Dennis and Terry are both LPG certified and Terry has also completed a course on Hybrid vehicles. Dennis is also qualified to carry out the 10 year inspection on gas cylinders and is available to do these as required. Carson's Car Care can carry out your log book servicing without losing your warranty.